Dr. Zhang has devoted his entire career to the pursuit of precision oncology – specifically to the key molecular and genomic events that drive the development and progression of cancer. Over the last 18 years, Dr. Zhang and his team have identified multiple novel cancer markers and oncogenic signaling molecules. These molecules are under extensive investigation to see how well they can predict the outcomes for stage IV colorectal cancer patients. Dr. Zhang has been using the microRNA molecule NGAL to make cancer cells more receptive to treatment. His research is uncovering defects in a BRCA2 gene that might sensitize gastric cancer to chemotherapy and, working with an international team of scientists from the U.S. and China, looking to discover a key factor that may explain drug resistance in glioblastoma multiforme (GBM), the deadliest form of brain cancer. These findings could give oncologists new diagnostic tools to improve disease management and patient survival. Additionally, Dr. Zhang has used an expanded high throughput genomic screen to identify targets for the treatment of a soft tissue sarcoma that develops from tissues surrounding nerves called malignant peripheral nerve sheath tumor (MPNST). Results have provided evidence that the tyrosine kinase receptor pathway is a potential therapeutic target for patients with MPSNT. Dr. Zhang is currently studying how genetic expression, amplification and mutations relate to and regulate each other. Using data from next-generation sequencing, Dr. Zhang is identifying growth-promoting genes of a patient’s cancer. Additionally, in July, 2017, Dr. Zhang released findings that African-American patients with smoking-related cancers have an increased mutation rate in several genes, including TP53. This discovery may help uncover why African-Americans typically have worse outcomes than Caucasians from smoking-related cancers. These findings may lead to the development of novel diagnostic and improved therapeutic options for patients. Wei Zhang, Ph.D., is the Director of Cancer Genomics and Precision Oncology at the Comprehensive Cancer Center of Wake Forest. He is also co-director of one of the Genome Data Analysis Centers. Dr. Zhang graduated from Peking University in Beijing, China in 1985 before receiving his Ph.D.in molecular biology from the University of Texas. From 1999 to 2016, Dr. Zhang was the director of the Genomics Core Laboratory at MD Anderson’s Cancer Center. In 2004, he joined the faculty of MD Anderson’s Cancer Center and, in just two years, rose to the rank of full professor, teaching pathology and cancer biology. 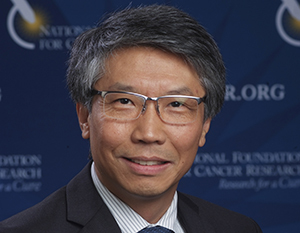 From 2014 to 2016, Dr. Zhang was the Director of the NFCR Center for Cancer System Informatics at MD Anderson’s Cancer Center. Dr. Zhang has published more than 320 peer-reviewed papers and his research has been supported by numerous grants from the National Cancer Institute, the Department of Defense, the Texas Higher Education Coordinating Board and several foundations, including NFCR, the Goldhirsh Foundation, the James S. McDonald Foundation and the Shriver Initiatives for Sarcoma. Your ticket for the: Wei Zhang, Ph.D.